If you are looking for low cost new Isuzu parts and spares, and are finding them difficult to locate you might just have found the answer to your problem. 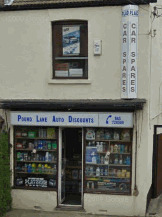 Pound Lane Auto Discounts in Basildon have a huge range of car spares, parts and accessories for all type of vehicles. Shop Online For The Best Prices And Availability Now! We have now made things easier for our customers with a new huge online store - Open 24 hours per day. Whenever you see the "Shop Here Online" image, you then have access to over 150,000 parts, accessories, oil, tools, and valeting products, from our sister site shown below. Get the best prices, availability and choices of car products from the comfort of your own home. You will never leave once you go in! And our Isuzu spares and parts range is expanding daily. And even better the spares and items for each of the Isuzu models listed below are all available online too. So no more phoning to query prices, or locating the item. Just click on the “Shop Here Online” logo throughout the site and you will have access to the largest selection of Isuzu parts in the whole of Essex. Pound Lane Auto Discounts are as we are known online “Car Spares Essex” have been supplying parts to the motorists of Essex since 1981. So that is over 30 years of knowing the best places to go for those hard to find items for your Isuzu. So if after checking on our online shop you still can't find what you want. This Sounds Good So Where Are You Exactly? If you want to use us to purchase Isuzu parts and spares then we are in a supremely convenient location. Based right in the centre of Essex, we are just outside of Basildon. But don't think that you are going to have to drive in your Isuzu to a busy Town-Center. As you can see from the image below, we are based a stones throw from all three of the main routes that cross Essex. So jump on the A127, A130 or A13 and be with us in minutes. Many of our customers come quite a distance, and say that its is quicker in the long run, as they can order their parts and then simply come and collect. So Now We Know Where You Are What Isuzu Parts Can You Offer? We have more and more parts becoming available everyday. From clutches, to exhaust systems. From service parts, such as oil, air and fuel filters, oils and spark plugs we can supply for most things. The list below highlights the majority of items for the Isuzu that we can sell, but there are times that you will be better off going elsewhere. For example sometimes its cheaper to get a part from a main dealer, or a breaker, or even one of our competitors. And if that is the case we will tell you, as we don't just want you as a customer once, but instead for many years.